Is this is the best Tesco Clubcard deal of the year? Or even the decade? 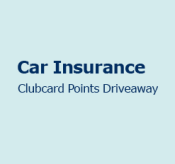 Via Tesco Bank, you will earn 50 Clubcard points if you take out Tesco Car Insurance before August 12th. You read that correctly. Just 50 bonus points. For something that may cost you £500+. You do have a tiny chance of winning a prize in a competition for new policyholders, but the chances of winning that are obviously small. I think this is one you can safely miss.